Soccer players must learn fundamental skills and tactical awareness to succeed during competitive games. Important soccer skills to master include ball control, passing, dribbling, shooting and defending. Tactical awareness involves the ability to know your role and have positional awareness on the field, and possessing the ability to make good decisions. The fundamental skills of soccer are vital to the development of a soccer player. You must have the ability to trap the ball and keep possession for your team to be effective during a competitive game. A high level of repetition is the best way to learn fundamental soccer skills. 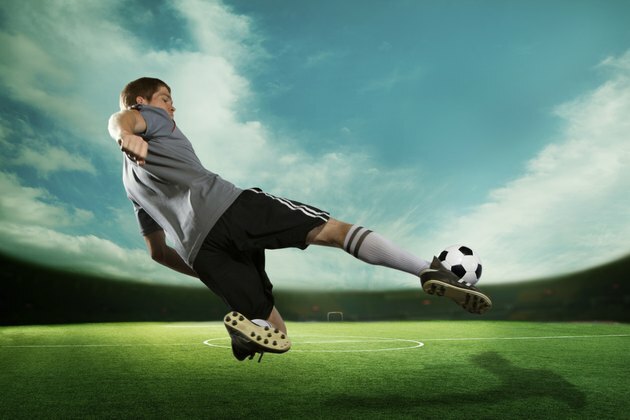 Soccer skills should be practiced initially under no defensive pressure, with the coach focusing on correct technique. For example, to practice dribbling, the coach should have players dribble a ball around a 20-yard box focusing on technique and keeping the ball under control. Passive resistance should be added by placing a number of cones down and teaching turns to avoid the obstacles. You can next pracrtice dribbling with two or three defenders inside the box attempting to win the ball, and providing game-like defensive pressure. Tactical awareness largely refers to a soccer player having the ability to make effective decisions during a soccer game. You can practice soccer tactics by using group drills that work on skills and forcing players to make decisions quickly in game-like situations. Playing three attackers against two defenders toward the goal can be good tactical practice. The attacking team can begin each repetition 25 yards out from goal. On the coach's signal, they begin play, attempting to score a goal with the two defenders attempting to stop them. The soccer coach can use this drill to practice teaching players when to dribble and when it is best to pass to a teammate. The decision of when to shoot should also be taught in this drill. Players should have an understanding of their role on the field, whether it be defender, midfielder or attacker. Regardless of position, all soccer players should have the tactical awareness to get open and provide a passing option when a teammate is in possession of the ball. When defending, a soccer player must have the ability to put pressure on the ball if they are the nearest defender, or to cover an off-the-ball runner, providing defensive balance.